Call Forwarding - Global TaNK Co., Ltd. 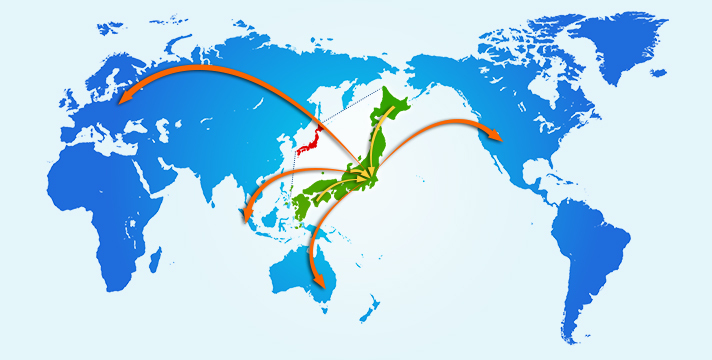 Call Forwarding from UltraCall is a convenient international calling service that automatically transfers calls made to a dedicated number in Japan (03 or 0120 numbers) to an overseas number at affordable rates. You can use this service for various business needs, whether it is for a large scale call centers providing customer support, reservations, or technical support in small-middle size business in foreign countries. All calls are instantly forwarded to your predetermined overseas number, whether from fixed phones, mobile phones, PHS handsets, public phones, or IP telephones. This service eliminates the need to set up a special line or overseas dedicated line for forwarding calls. After you apply, we will inform you the dedicated number. *A separate fee applies to toll-free forwarding. Basic monthly charge as below is required as well as call charges. *An additional 30 yen is applied for forwarding to mobile phones overseas. *If you would like to keep using your current phone number(03-xxxx-xxxx) and forward to an overseas number, domestic call forwarding service (called Voice Warp in NTT service) is available.Your current number(03-xxxx-xxxA)→domestic call forward by Voice Warp→your dedicated number(03-xxxx-xxxB)→oversea number. Any costs for Voice Warp are the responsibility of you.